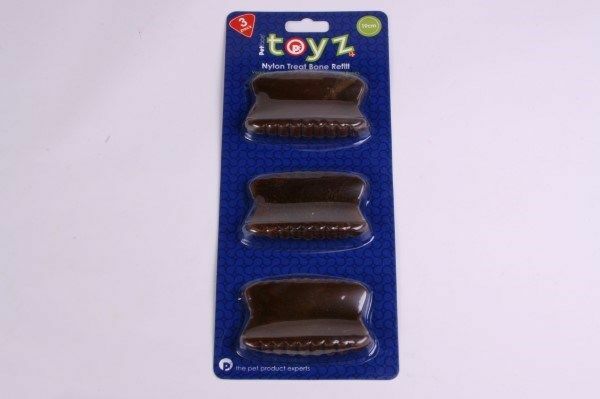 Your dog will relish the lip-smacking flavour of the Toyz Veggie Treat. It is tasty and chewy and will tickle your pet's taste buds. This medium density treat is ideal for those dogs that prefer a more substantial treat to chew on and one that lasts longer than a munchy stick or a flat strip. The length of time a chew lasts is obviously dependent upon the type and breed of dog. Some dogs will demolish a treat in a few minutes, whilst others will take their time, savouring the moment. This treat is ideal for adult dogs. Please do not give to puppies under 4 months old. A dog's natural inclination to chew will help to remove tartar and plaque and keep your dog's teeth and gums clean and healthy. The treat should be fed as part of a balanced diet. Starch powder, soy protein isolate powder, water, glutelin powder, bran, yeast, glycerine, multivitamin, compound preservative. Available in four sizes to correspond with the different sizes of Nylon Treat Bone.